Many university students are faced with a crushing load of course readings- so where does that leave reading for pleasure? 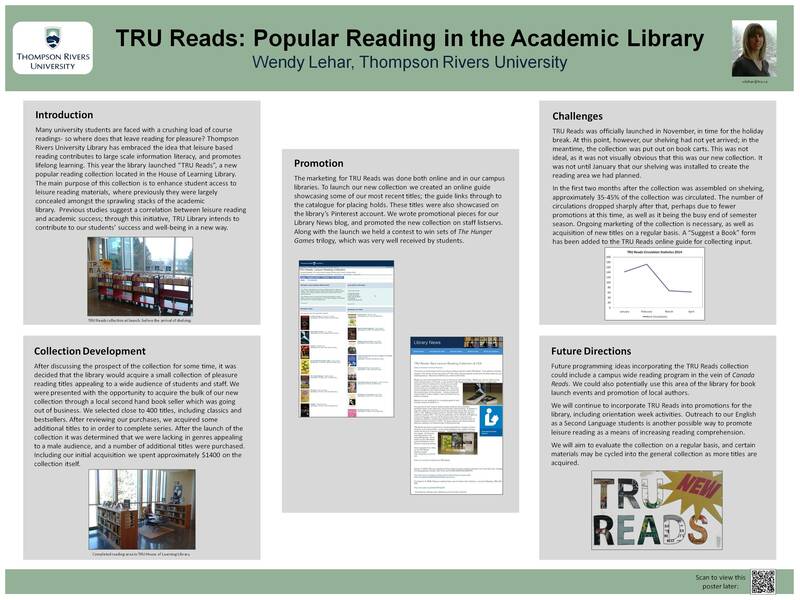 Thompson Rivers University has embraced the idea that leisure based reading contributes to large scale information literacy, and promotes lifelong learning. This year the library launched “TRU Reads”, a new popular reading collection located in the House of Learning Library. The main purpose of this collection is to enhance student access to leisure reading materials, where previously they were largely concealed amongst the sprawling stacks of the academic library. Previous studies suggest a correlation between leisure reading and academic success; through this initiative, TRU Library intends to contribute to our students’ success and well-being in a new way. This is interesting and I’d love to share this with colleagues, but we’re not using Twitter, so I thought I’d let you know that you might want to include an email link to your articles as well as a post to FB option. And if you do have them and I’m not seeing them then you may want to rethink visibility.